Narrator: There was a demon that lived in the air. They said whoever challenged him would die. Their controls would freeze up, their planes would buffet wildly, and they would disintegrate. The demon lived at Mach 1 on the meter, seven hundred and fifty miles an hour, where the air could no longer move out of the way. He lived behind a barrier through which they said no man could ever pass. They called it the sound barrier. Following the breaking of the sound barrier by pilot Chuck Yeager, the next barrier was space. 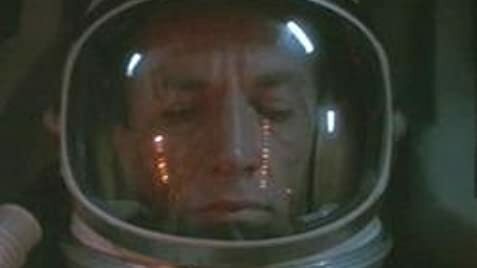 With the Russians and America in a race to see who can get there first and be highest, quickest and longest in space, a group of pilots are selected to become the first men in space for America. I have had this film for many years and have only seen it twice now  I always get put off by having to find three + hours free to watch it! However I am a fool as whenever I do watch it the time flies by easily. Such is the appeal of the film that everything works and only the odd scene at the end drags a little. The story skips through the space programme focusing as much on the flights as it does on the men and their families. It also manages to be very light hearted and good humoured, which succeeds in making it easy and fun to watch. The history being told may not be well known by all (I'm too young to remember and am also in the UK), but it is well told and becomes more a story of the men whose courage made it happen rather than a history lesson. Given that so much hinges on the men being interesting and likeable characters it was important to have a good cast, and the ensemble assembled here really put in good work to bring the names to life (although how close to their real personalities they are I cannot say). Taking one as an example, Fred Ward manages to be funny but also has to convey the more difficult side as he is forced to live with blame for the outcome of his mission. 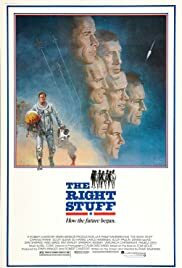 Shepard represents the `unsung' pilots left behind in the sky who put the space programme in motion in the first place, and he does it well with a real sense that he has a lot of men behind him. Glenn, Harris, Quaid Henriksen, Frank and Paulin all do sterling work to varying degrees. However even minor roles are played by faces who do well  Hershey is good and carries the role of `the women behind the men' really well. Moffat is funny as Lyndon Johnson and Goldblum and Shearer are hilarious with their running jokes. The film is very flag waving  but the good humour stopped that aspect of it sticking in my throat. It is a very enjoyable and accomplished film. Not only does it manage to inform and entertain but it also paints a very good picture of the men who started and ran the space programme and the effect the risks had on them and their families. All this and it still makes me laugh out loud! Three hours simply flies by.